To keep a clear view at all times on the slopes, Mister Spex offers a comprehensive range of ski and snowboard goggles. Eyewear from all the top brands ensure that your vision is always at its best, even in tough conditions. Equip yourself today for your personal winter sport! 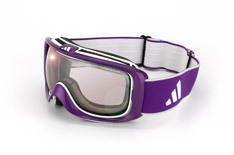 Stylish Adidas ski goggles are absolute trendsetters on the slopes. 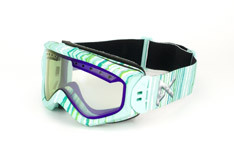 For those who want not only the highest quality goggles, but also want to make a fashion statement. For collectors: with the signature range from Adidas you can experience a different class of ski goggles. 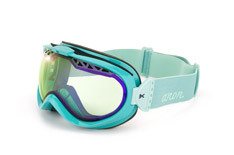 The Mister Spex naturally includes all the classics of the ski goggle world. Quiksilver, Uvex and Oakley are top-sellers among our product range. The sleekest models are optimised with the best quality specifications, offering you innovative technologies and sophisticated protective systems. 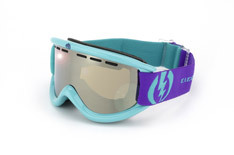 The ski goggles in our selection are your dependable accessory for every snow environment. Trendy highlights are provided by the youth lines from Roxy by Quiksilver and Scott. Flashes of colour, striking patterns and attention to detail mean that these ski goggles are more than just protection for your eyes during skiing or snowboarding. Let yourself be inspired by the wide choice of ski goggles offered by Mister Spex! Our top brands are perfectly suited for your personal style and offer you the best protection for your winter sport. You can also use the filter in the left navigation bar to help you find your favourite ski goggles even faster in the Mister Spex online store. If you are looking for a specific ski goggle brand, then just click on the brand you are searching for in the list. Once you've placed your order Mister Spex will dispatch your eyewear as soon as possible, often the very same day. If you are unhappy with your new sports eyewear, please return it within 30 days for a refund or replacement.